Walton's Home Stay - ‘The house by the side of the Road’ - Sam Walter Foss at Walton Hall is situated in the heritage zone of this historic village famed for its Chinese fishing nets, the Jew Synagogue and the Dutch Palace and home to the art and culture of Kerala. This relaxing and serene home stay is run by a Catholic family in a Centuries old Dutch building. 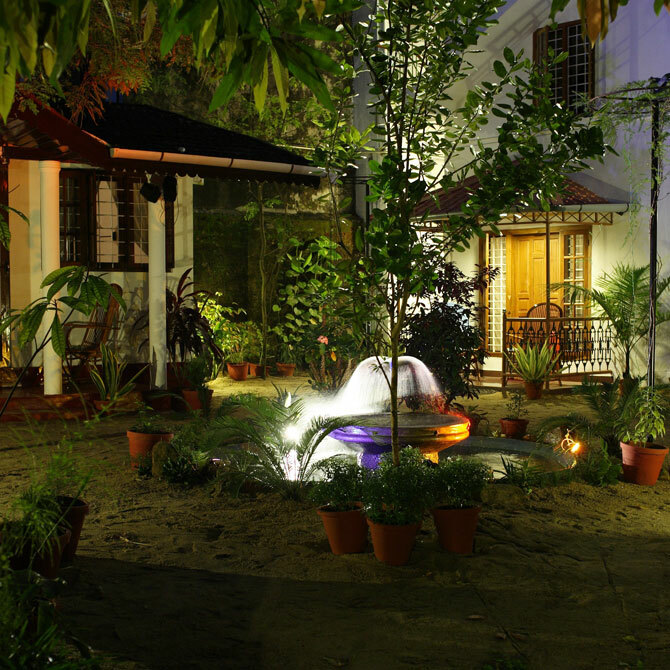 It is centrally located on Princes street - one of the earliest streets laid out in Fort Cochin, beside the many shops, the Cozy streets, cafe’s and restaurant’s which are convinctly located near by. In this family run home stay, we pride ourselves on a high standard of friendly cheerful service which cafers to the needs of the whole family. "The philosophy behind - our secret Mantra" - A place away from home - a place like home. "Let me live in a house by the side of the road and be a friend to man". These words are taken from the poem. ‘The House by the Side of the Road” written by the American poet Sam Walter Foss, Christopher Walton had studied this poem at college and since then the word’s of the poet have inspired him to acts of kindness. These acts of kindness are passed on to his family members, the society he is with and to guests visiting - making the world a better place to live in. From the hazel and recat of every day life, one walks into Walton’s - a refreshing casis, of peace and Kanquility with a garden full of birds. A plentiful supply of second land books at “Every man’s the Second Hand Bookshop run on the ground floor. The innkeepers believing that good books, like good friends always keep you good company “Every man I will go with thee and be my guide. In my most need to go by my side”.